We love it when birds make their nests in our yards. We spent hours observing the mother bird taking care of her young, watched closely as the baby birds grow up and fly away, and now it's time to clean up the nest they left behind. Whether you are cleaning blue bird houses or planning a day of wren bird house cleaning... cleaning and maintaining your birdhouse is an important part of caring for the birds that make your back yard their home. If you enjoy watching birds in your backyard, it's a good bet that you have a bird house or two hung up for your birds to nest in. And if birds have made themselves at home, once they move out you'll want to clean any used birdhouses well. Some birds will have several broods, so when you are sure a nest isn't being used any more, go ahead and clean it out. When to clean bird houses depends on the bird activity in your yard. A good rule of thumb is to keep an eye on the birdhouse in question and make sure you don't see any birds going in and out of the birdhouse for at least a week before you take it down or open it up. 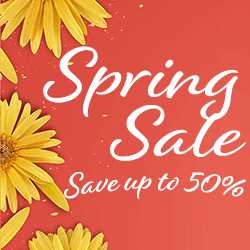 Then set aside a few minutes to make your birdhouse ready for the next season. Before you start actually cleaning the birdhouse, make sure to put on your gloves so you are ready to go. Take down the birdhouse if at all possible; otherwise, disassemble it – taking special care to note how it came apart so you can put it back together again. 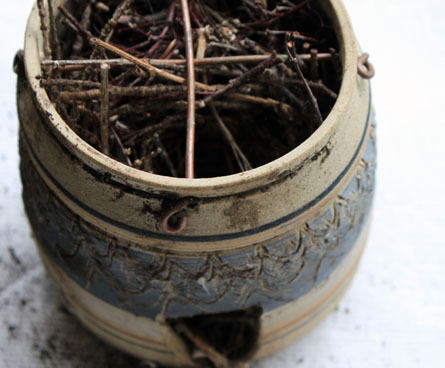 Bird nests are often quite interesting to look at. Before you tear out the nest, take a moment to admire the work that went into building this seasonal home for your feathered friends. Set the birdhouse on a table with some old newspapers or paper towels so it's easier to dispose of the old nest and waste materials. You may want to label the parts or take pictures with your smart phone to save time later. This bird feeder was turned into a bird house by some energetic wrens, so it's got to be taken down and cleaned well in order to return to its place in the yard as a bird feeder. 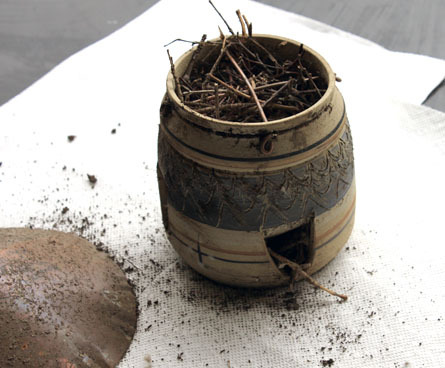 Remove the bird nest, eggs and scrape off any remaining organic matter that is on the birdhouse. The more material you can remove in this step, the easier it will be to sanitize your birdhouse later. Mix water with your cleaning solution. Pour the bird house cleaner into a bucket of warm water OR or mix 1 part chlorine bleach with 9 parts hot water. Bleach will stain clothes so be careful as you mix the bleach and water together. Scrub the inside of the bird house completely with the toothbrush and the cleaning solution. It's especially important to get in corners and holes that may get filled with unwanted materials. Use toothpicks to clean out any holes in your birdhouse that may not be completely open. Whether drainage or ventilation holes… take care of the tiny details that make birds more comfortable and safe. When you are cleaning your bird house, it's a good idea to also clean any hardware that you are using to hang or mount the birdhouse. Wipe the hardware down thoroughly too, being careful not to get any cleaning materials on nearby plants. Rinse the birdhouse and hardware thoroughly for several minutes with clean water. While getting into the crevices of the birdhouse, if you use bleach make sure you avoid splashing it on yourself. Air dry the birdhouse in the sun. This will help eliminate remaining cleaning solution residue and minimize the potential for mold or bacteria to grow on the wet surfaces. You can simply dry off the hardware with a paper towel as it is not part of the birds' nesting area. Use your hammer and / or screwdriver to repair your birdhouse. 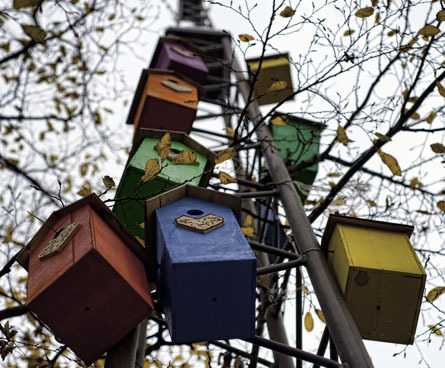 Loose hinges, protruding nails or even chipped wood can be dangerous to birds who reside in the birdhouse so make these fixes now while the birdhouse is not being used. Re-assemble and hang your clean birdhouse (or in this case, an improvised birdhouse that is really a bird feeder) back up when you are done. If you took pictures in step 1, refer to them so your birdhouse comes back together perfectly! Remember that when to clean out bird houses depends on your birds. You don't want to clean out the bird house too soon or you will chase off the birds. On the other hand, if you wait too long you might miss the chance to have a new family move in. Some birds would like to use your bird houses as winter roosting spots, and as protection from the elements. 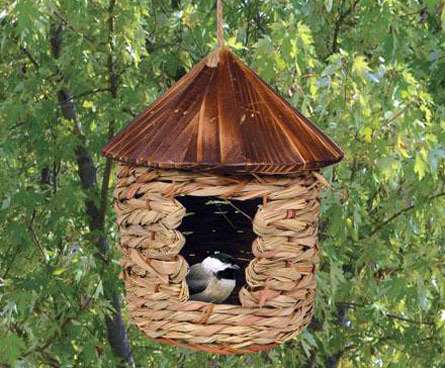 This is a great way to get some extra use out of your birdhouses in the winter months. If you don't to put out your good bird houses in winter, you may want to consider a simple nesting box like this one. 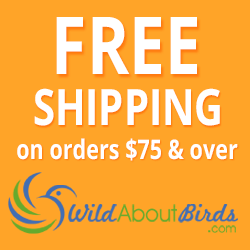 You might just be able to enjoy birds year-round!